Your sales force is firing on all cylinders every day of the week, scrambling just to keep up with demand for your home improvement services. You’ve got a contractor marketing system that’s performing so well you never have to worry where your next lead will come from. Your yearly revenue objective? You’re about to crush it. Wouldn’t it be amazing if this were true? In fact, most contractors I speak with are still searching high and low for the one marketing company that knows “the secret” to getting them into the heavy hitters club. However, the reality is that there’s no such thing, and definitely no marketing secret that’s reserved for a particular marketing agency. What the successful businesses have realized is how to find the right talent, hire them, and move out of their way. If you’ve never had the pleasure of experiencing contractor euphoria first hand, continue reading because what follows are the exact steps you need to take to hire the right contractor marketing agency. I’ve boiled everything down to just three simple stages I call THE GOAL, THE HUNT, and THE TRIGGER. Sit back, grab a coffee (or a beer depending on when you’re reading this) and hopefully my years of experience in the marketing world can save you from getting burned (yet again–sigh), and help you get the results you want, without wasting much time and money. I’ve been in online marketing for over fourteen years now. I’ve sold marketing technology and consulted for digital agencies across North America so I know the agency world really well. I got the itch to start my own agency back in 2010. I co-founded Webrunner in 2012. We’re privately owned, owner operated, and profitable. We’ve grown organically without the need to take on investment capital. Though we’re highly skilled in most areas of digital marketing, we’ve chosen to specialize in ONE thing—generating leads for contractors with paid advertising. We practice what we preach and generate our own leads through scalable paid advertising & content marketing. We host the annual Contractors Success Summit and our team is behind the Contractor Success Academy, a site geared towards helping contractors hones their business skills. Enough about me. Let’s get to it. Not what you want, but what you NEED. Put your ego aside for a second. Remember, you’re a contractor, not a marketer. There’s no reason for you to reach out to marketing companies and tell them what you want them to do. Inexperienced firms will say, “Sure! We can do that!” and take your money, delivering exactly what you asked for regardless of whether or not it’s a good fit. The last thing you want is for an agency to take orders from you just because they’re scared to say no, or because they couldn’t be bothered to dig deeper to uncover what your business truly needs. Just like a client shouldn’t tell you how to execute their kitchen or bathroom reno, contractors shouldn’t tell their marketing companies what to do. Stop for a second and ask yourself why we market products & services to begin with. Claude C. Hopkins puts it best in his book titled Scientific Advertising which is touted as the “The Book Recommended by More Advertising Geniuses Than Any Other“. Now, if you’re thinking of calling me up to tell me you want more sales, don’t. You’ve missed the point. Everyone wants more sales. You’ve got to be more specific. Consider how many more sales you’d like and base the number on your capacity to take on and deliver more work. Can you handle five more jobs per month? Maybe you want to deliver an additional two hundred jobs this year? The point is, be clear in terms of what you’re looking to achieve. With that number in mind, you’ve got a better idea of how many leads you’ll need in order for that to become a reality thanks to your sales closing ratio. Don’t have a handle on your close rate? Look at all the leads you’ve received over the past ninety days, subtract all the referrals & word of mouth business, and divide this number by the number of sales you’ve made. Multiply by 100 and you’ve got your closing percentage. Free Download: Get the Contractor PPC Profitability Calculator to see what kind of growth you can achieve with pay per click advertising. For example, a contractor who sold 24 jobs from 120 leads would have a 20% close rate. With these numbers, you can paint someone a picture that accurately depicts what you’re expecting from a marketing standpoint. To illustrate my point, let’s say your goal is to sell an additional three jobs per month (or 36 jobs in the next 12 months), at an average of $14K, each with 40% in gross profit. Knowing that you typically close about 20% of your leads, we can determine that you’ll need 15 leads per month to make those 3 sales. Furthermore, we also know that this would represent $42K in sales and $16.8K in monthly gross profit. Multiply this by twelve months and you’ll notice that you stand to increase revenue by $504K and gross profits by $201.6K. Now you’re better positioned to have a conversation with a marketing company about what you’re really after. One, it lets the marketing company know that what you’re after is a measurable result. Not only that, but you also know precisely the volume by which you’re looking to increase sales along with the number of leads you anticipate requiring to achieve those numbers. And two, the marketing company knows you mean business and you’ve already established the yardstick that you’ll be using to measure their performance. Aside from getting started on the right foot, when the marketing company presents pricing to you, you won’t be looking at it purely from a cost perspective. You’ll be able to tie everything back to the fact that these fifteen new leads per month should help you achieve your goal of adding $500K to your top line revenue with $200K in gross profit. Suddenly, the notion of investing a couple thousand dollars per month online to help you achieve those numbers becomes much easier to justify. (source: Giphy)Without running through the numbers and clearly identifying your goals in a similar fashion, you run the risk of making emotional decisions based on feelings rather data. You’ll cut corners and you’ll bring on individuals who claim to be able to help you market your business on the cheap. Your cousin, nephew, or the freelancer who was referred to you by your friend who happens to know a guy, who knows another guy… you get the idea. My advice for this phase is simple. Forget generalists and go with experts that are specialized in whatever it is that you need. In the example above, we focused on generating roofing leads. But that may not be what you need. Maybe you need HVAC marketing. Or maybe you desperately need a more modern looking website to get you out of the stone age. It could be that your presence across social media networks is terrible because you don’t have the patience, time, or expertise to manage it yourself. If those aren’t an issue for you, then maybe it’s blogging or content production for the purpose of boosting your local SEO. Whatever the case, there’s a marketing company that’s better suited to tackle the job than anyone else because they’ve made that their sole mission in business. Is it possible to find companies that can do it all under one roof? Absolutely! Most agencies out there will claim to be “full service” and that’s precisely what you should watch out for. As the saying goes, jack of all trades, master of none! Now that you can pinpoint the type of expert service you require, fire up the old laptop (or phone) and head over to Google. Pay attention to Google’s suggestions or autocomplete feature as you type. It’ll give you ideas. 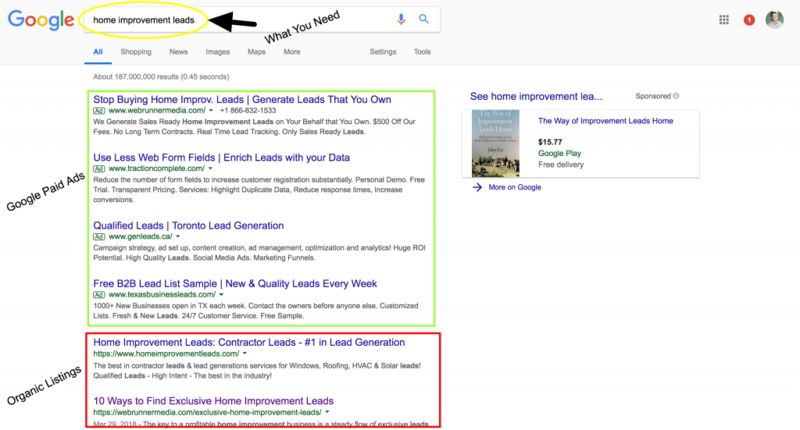 Using my roofer from Fort Worth, TX as an example, he might search for terms like contractor marketing, roofing leads, roofer marketing, or exclusive home improvement leads. Type each term into Google and scan the results page to come up with a list of different agencies. Pay attention to both paid and organic listings and look for results that cater to your needs while positioning the agency as an expert for that particular service. You’ll notice that after doing a couple of keyword searches, there’ll be a few companies that continue to show up. These are the ones you want to include in your list. Don’t go crazy trying to find thirty different companies. Run half a dozen keyword searches and try to identify a handful of specialized agency options. Google the name of each company (without the dot com) and scan the results page. Here’s where you begin to act like a private investigator. Read through the results and see what you find. Do they seem to be experts in what I need? What are their customers saying about them? How satisfied are their customers? Do their employees enjoy working there? Do they actively market their own business? Who is behind this company? These are all things that you can easily find on Google BEFORE even heading over to their website. Head over to their website and see what they’re about. Can you quickly determine whether or not they can help you get what you need? Dig a little deeper and read through a few case studies (hopefully they have some), read through client reviews & testimonials, head over to their blog and read a few posts. This should help you better understand how savvy/technical they really are. What you’re looking for is proof that they’ve delivered results based on the claims and promises they make on their website. Then look for links to their social media profiles and check out what’s happening there too. Most companies today are getting into video and so it becomes infinitely easier to get a feel for a company when compared to clicking through pages on a website. Run through these steps for the handful of companies you’ve come up with in step two and narrow down your results to your top three favorite options. Remember that if what you’re looking for is contractor leads, the narrative on their website should mainly be about leads. As should their case studies, client testimonials etc. If it’s a snazzy website you’re after, judge the agency based on their own website, along with other contractor websites they’ve developed for existing clients. From there, all that’s left is pulling the trigger. Don’t take your safety off just yet cowboy, you need to speak with your shortlist first. When you first reach out to your top choices, do so by email. Complete a form on their website or contact page. Take note of how quickly they get back to you. The sooner the better. Never commit to anything or anyone during your first conversation. Let them know that you’re evaluating options and that you’ll want to do your homework. The sales people you speak with should ask you a series of questions in order for them to better understand your business and hopefully uncover your true needs (remember—not wants!). They should be more focused on listening to your responses than trying to sell you something. As they present their solution to your problem, always come back to the fact that you have to somehow generate a return on your investment. They should be the ones to walk you through exactly how that will happen, whether it’s pay per click, SEO, email marketing, or other. On your end, there are a couple things you absolutely need to get answers to before you can make any final decisions. How quickly can I expect to see a return on this investment? What type of commitments do you need from me? What is the total investment? How do I know this will do what you say it will? What happens if I’m not satisfied or your fall short on your promise? Be careful with guarantees. There are many aspects of online marketing that simply can’t be guaranteed. If a marketing company is making promises to get you ranked on Google in as little as one week, for all your top keywords, and promises that you’ll stay there… RUN! One way to counter this is to ask them to SHOW you what they’ve done instead of TELLING you what they’ve done. There’s no way to skate around that one. Asking to speak with their existing client(s) isn’t ideal. Why? When this happens, agencies reach out to their top clients to let them know that you’ll be calling to sniff around about whether or not they’re any good. They take the opportunity while on the phone to bring up the fact that they haven’t connected in a while and that they’re due for lunch one of these days. The conversation you end up having with their client is tainted by all the steak dinners and drinks they shared over the years. Just do your own recon work. It’s simpler for everyone and you’ll avoid curveballs. Lastly, make sure that the company you decide on has a good mix of strategy AND tactics. Strategy alone is only good in theory. Tactics alone, well, that’s just not smart. Choose a company that has a sound strategy, has the team and experience to successfully execute the mandate successfully, and that’s already done it for businesses similar to yours. Then, just pull the trigger! (source: Giphy)Now now, it’s not time to get the party started just yet. Everyone gets excited when a new partnership is forged and there’s nothing wrong with that. But now’s where the rubber meets the road. Accountability is what you’re going to want to focus on next. You need to ensure that the company you hire delivers as promised. Let them do their work. Support them to the best of your abilities, and get out of their way. Review results early on in the relationship and make sure no one deviates from the initial plan, unless there’s a good reason to do so. If you want to improve anything, you have to be able to measure it, so make sure that both you and the agency, are clear on what the expected outcome is. Three simple steps to help you find and hire that missing puzzle piece needed to scale your home improvement business. Now you can get the party started. Just remember to invite me! Have any questions about hiring an agency or contractor marketing in general? Leave a comment below, or book a demo to learn more about how we can help get you more leads each month! Marc is the Co-founder of Webrunner Media and handles business development, marketing strategy, and agency growth. When he’s not talking to business owners about growing their revenues, he’s helping Webrunner improve their systems & processes to better serve their customers. Connect with him on LinkedIn.